You must be a Singapore citizen and SpexCarded athlete to proceed below. How to get the FPUL form? – Please contact us at SAA for the form, please indicate your unit either from MINDEF / MHA (SPF/SCDF). Singapore Athletics will then forward the document to SportSG. When SportSG receives the application, they will review the application, and will submit to MCCY for review. MCCY will then submit the application to MINDEF / MHA (SPF/SCDF) for processing. MINDEF/MHA is the only approving authority for NS FPUL/TO application. If only the application is successful, MINDEF/MHA HQ will inform the respective unit on the approval to release the sportsman for TO/FPUL. You will have to submit the form to us for every quarter. For Q1 (April to June) – submit by end Feb.
For Q2 (July to September) – submit by end May. For Q3 (October to December) – submit by end August. For Q4 (January to March) – submit by end November. This application may take at least 5 weeks and beyond, so please apply in advance. NSF serving with less than 1 year of service – Basic sportsman benefits of TO and FPUL. NSF serving 1 years after of service – Basic sportsman benefits of TO and FPUL plus SSS/HTSS emplacement. Please consult your coach and NS unit before submitting the form. Plan ahead as early as possible. The whole application process takes around 5-6 weeks (From the time SportSG receives the application) as required by MCCY and MINDEF/MHA. Please allow us 3-working day to reply and acknowledge your application. Any application not fully furnished or not in order with timelines, will not be endorsed. All applications are to be endorsed by Singapore Athletics before submitting to SportSG. No time-off will be granted whilst on Basic Military Training (BMT) and any vocational trainings subsequently. A daily training attendance will have to be maintained by the NSF and submitted to Singapore Athletics each month. Sportsman may apply for SSS/HTSS emplacement quarterly for enhanced TO and FPUL privileges if he fulfils the criteria (Please contact us for more details). SSS/HTSS emplacement applicant must at least be PES A or B status. 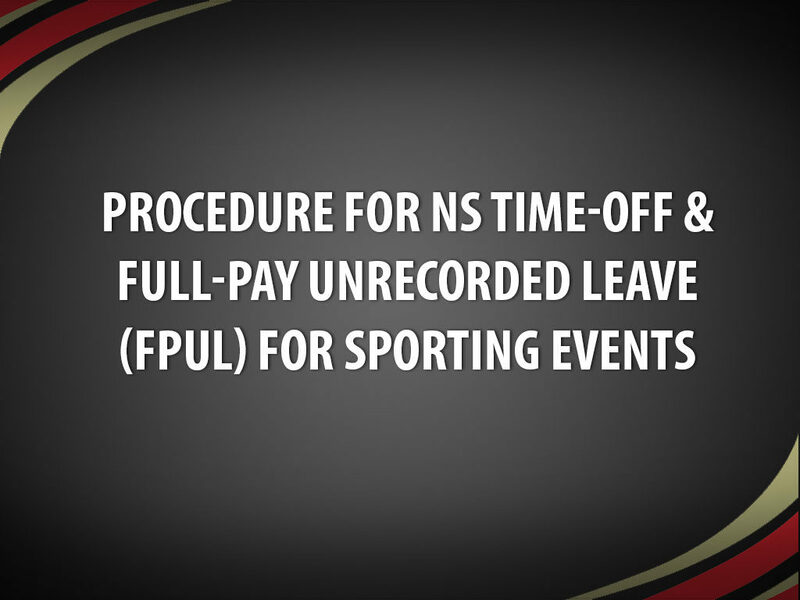 TO and FPUL entitlements are only pegged to Major Games / key competitions / intensive training camp, and not for any sporting events. This is still subject to MINDEF/MHA’s prerogative on approval. Sportsman not emplaced under SSS/HTSS can only enjoy basic sportsman benefits.